– For the first time the new software displays 14 Chinese meridians. Altogether there are 12 pairs of main organ channels corresponding to 12 main organs of Traditional Chinese Medicine and 2 non-pair meridians on human body. All main channels are linked into one system. One transforms into another in strict succession with Chi flow. This live energy is distributed to the whole organism through the channels and unites all functional blocks of an organism. Jing-luo is a teaching of 14 meridians; it is one of the main teachings of Traditional Chinese Medicine. Jing-luo explains physiological functions and pathological changes of human organism and is used for diagnostics and treatment. It is also a basis for acupuncture. It is considered that function of a meridian is to ensure flow of Chi, support functional activity of organs and harmonize Yin and Yang in an organism. In case of pathology changing of one organ’s function inevitably changes functioning of other organs, i.e. whole organism becomes involved into unhealthy process. – Etalons database of “Red Dragon” software is extended by food products and dishes of Traditional Chinese cooking which are recommended for clinical nutrition. – Lithotherapy. The new software has spectrums of minerals and jewels. It allows to select a jewel for a person strictly individually in compliance with biological compatibility and carry out lythotherapy – treatment of an organism by mineral’s spectrum. Special molecular composition of crystal structures provides energy impact to cellular and biomolecular systems of an organism. Some jewels may enter into specific harmonic resonance with certain parts of our organism. Vibrational energy is transferred to a certain molecular system and it harmonizes Yin and Yang, stabilizes biochemical processes, improves level of cellular structure, restores unhealthy organ and increases tendencies for recovery. – “Red Dragon” software has feature of three-dimensional reconstruction of pictures on the basis of data acquired during multidimensional examination – study of hollow organs according to principle of “virtual NLS-scopy” by using of LAPP system (system of parallel processors of ultrahigh computing power and performance). Preparation of NLS pictures for visual analysis is fulfilled with help of 4-D Tissue original method invented by the Institute, that allows not only getting of virtual multidimensional pictures of anatomic structures, but also choose interesting biologic tissue – “additional dimension” and visualize bones, soft tissues and vessels simultaneously. New development of the IPP – «Metapathia GR Clinical» software. 3) New section – Microelements (introduced all chemical elements contained in human organism, dependence of chemical elements wave spectrums character on their location in periodic table is revealed) which give us a possibility to evaluate quantitatively indices of human organism homeostasis and diagnose its disorders on early stages. 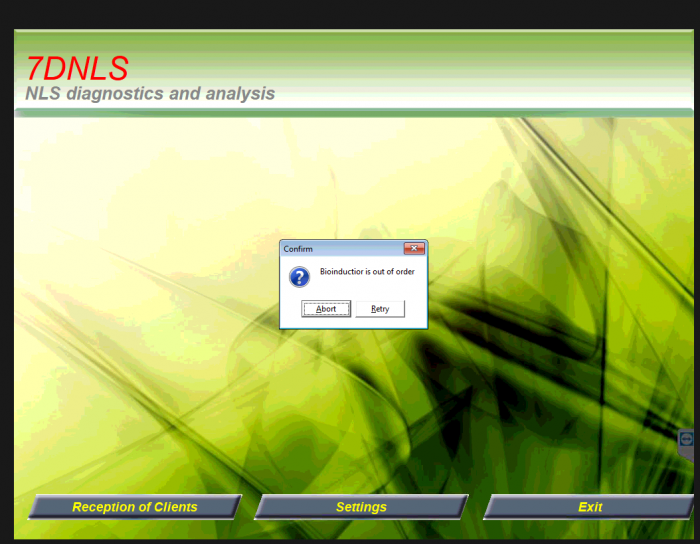 Using NLS analysis function it became possible to reveal and control content of various microelements in an organism. Using NLS-systems one may find out that microscopic amount of some chemical elements, such as gold, for example, is also important for preserving of good health condition. Many others microelements participate in functioning of vibratory and bio-electronic systems of human organism and his CNS. 7) In this software we introduced new feature “Psychoemotional state” which allows us to evaluate in real-time mode emotional background of a patient and detect interrelation between development of mental and somatic pathology and emotional state of a patient. 9) For the first time we introduced Bach flower remedies into “Metapathia GR Clinical” software. IV. “Metapathia GR Clinical” software has a significantly increased accuracy of acquired diagnostic results by establishing of feedback system between a patient and HSS. This objective is reached by introducing of possibility to enter into software results of patients’ biochemical analyses (blood/urine) acquired by laboratory method. V. All software databases of new software are translated into few foreign languages. Thus new “Metapathia GR Clinical” software will support not only Russian, English and German languages, but Italian, French and Japanese languages also, which significantly extends geography of application of this innovative technology! Nowadays software is being translated into Chinese and Spanish languages. – adaptation of a brand new system of continuous scanning developed together with our USA partner Clinic Tech Inc. for high-performance multidimensional non-linear scanners (metatrons) of Z series, thus reliability of researches is increased greatly. – The main peculiarity of HSS “Metatron”-4025 with “Metapathia GR Hunter” software is “multidimensional virtual scanning” that allows automatically localize a nidus of tumor, hereditary diseases and reveal a reason of its appearance at genome level, by sequential passing through histological and cytological sections, chromosomes and going deeper to fragments of DNA molecule. – Introduced for the first time in “Metapathia GR Hunter” software: all peculiar to Homo Sapiens species anatomical, histological, cytological structures including ultramicroscopic ones. – Introduced for the first time in “Metapathia GR Hunter” software: spectrums of minerals and gems, it allows to select according to individual biocompatibility a gem for permanent carrying or apply lithotherapy – healing treatment of organism by mineral radiated spectrum. – Introduced for the first time in “Metapathia GR Hunter” software: a possibility to evaluate not only tissues of human organism, but also an ultra structure of microbial agents, viruses, helminthes, rickettsia, toxoplasms and trace on which parts of bacterial cell various antimicrobial medications influence. – Introduced for the first time in “Metapathia GR Hunter” software: “iridodiagnostics” and “auricolodiagnostics” modes. – Introduced for the first time in “Metapathia GR Hunter” software: selection of homeopathic medications with potency taken into consideration. – Introduced for the first time in “Metapathia GR Hunter” software: introduced “Smart-filter” function for handy and quick automatic selection of spectral processes and medications with process topology taken into account. The Institute of Practical Psychophysics has developed new and relatively cheap hardware-software system “Metatron”-4017 with “NutriSoft-Emerald” softwarewhich has many of “Metapathia GR Hunter” software functions. As in “Metatron”-4025 model, continuous spiral scanning block is also used in this system which increases 3 times more patient investigation speed and accuracy of diagnostics. – “NutriSoft-Emerald” program has mineral and gems spectrums which allows individual and biological compatible selection of gems for constant bearing and also allows litotherapy, which means therapeutic action by spectrum mineral emanation. – “NutriSoft-Emerald” program has widened vegetative medication spectrums and also there are some images of various plants are shown and a possibility of phytotherapy, which means therapeutic action by plant spectrum. – “NutriSoft-Emerald” program has an increased number of anatomical, histological and cytological organs images, including dental module. – “NutriSoft-Emerald” software just like “Metapathia GR Hunter” software has the possibility of “virtual multidimensional scanning” which allows localizing of pathology nidus automatically, in following order: anatomical – histological – cytological stages. – One of the most doubtless advantages of new “Metatron” -4017 hardware-software complex with “NutriSoft-Emerald” program is the combination of low price and product high quality.